This award will be given to the individual who, in the opinion of the judging panel, deserves to be honoured for his or her contribution to further education above and beyond their own academic interests. Institutions and individuals are welcome to submit nominations for consideration. This award seeks to reward the individual whose passion, knowledge and skill have inspired students to success and who have made a major contribution to educational life. It is open to all UK further education institutions, including colleges, training providers, employer providers and adult and community learning providers. Up to two members of staff can be nominated from any one institution. How has this teacher brought about positive change beyond his/her own learners? How does this teacher demonstrate commitment and achievement in his/her own professional development? This award is aimed at recognising exceptional leadership in FE in the UK for the year 2017-18. As previous short-listed candidates demonstrate, leadership includes but is not confined to institutional leadership and extends beyond and below the CEO. Nominations from staff, boards/trustees and/or stakeholders should make clear what characterises the exceptional achievement with particular emphasis on impact. Judges welcome, in particular, robust independent testimonials in support of the nomination. This will be awarded to the provider that has demonstrated exceptional performance in the past academic year. It covers the year 2017-18 and is open to all independent training providers. High quality teaching and learning, learner achievement and business performance are important factors, the main criterion will be evidence of particular bold, imaginative and innovative initiatives that have advanced your reputation and performance over the last year. Explain how you evaluate and develop your provider’s professional progress with regard to teaching, learning and assessment. How has your engagement with students impacted positively in and beyond your institution? If applicable explain how it has had an effect beyond your own institution. Judges will be looking for evidence of sustained commitment to advancing and positively influencing the student experience. How has your college made a significant and distinctive contribution to your local economy and wider community? This award seeks to reward the colleges whose imagination and passion have led to stellar provision in all areas. We are looking for evidence of excellence in providing a high-quality curriculum with excellent student outcomes, reflected in strong recruitment and success rates. It is open to all UK further education colleges, including land-based colleges. Explain how you evaluate and develop your college’s professional progress with regard to teaching, learning and assessment. Describe any new ways you have developed working with employers or in case of employer providers the main workforce. Explain how you have developed the route into your programme, including how diversity has been addressed. Explain the positive impacts of your provision on the businesses you work with. This is a new award which seeks to recognise sixth form colleges which best epitomise the qualities which make the sector so distinctive. We are looking for evidence of excellence in 16-18 education across the board in terms of the quality of teaching and learning as well as outcomes. We would also want to see evidence of reaching out to other institutions and a commitment to sharing good practice and raising achievement more widely. It is open to all designated sixth form colleges in England. The award is open to both incorporated colleges and former incorporated colleges which have converted, of are in the process of converting to, academy status. Demonstrate teaching and learning practices which are particularly effective and innovative. Demonstrate a commitment to disseminating good practice which has had a positive impact beyond your own institution. Case studies will be welcomed but submissions need to demonstrate that they exemplify qualities which are common rather than exceptional in the college. This award seeks to reward the specialist providers whose imagination and passion have led to stellar provision and support for SEND students and those with specific learning requirements. We are looking for evidence of excellence in providing a high-quality curriculum with excellent student outcomes, reflected in strong recruitment and success rates. It is open to all specialist colleges and providers, and specialist units housed within colleges and learning centres. Explain how you evaluate and develop your institution’s professional progress with regard to teaching, learning and assessment. How has your engagement with students and parents impacted positively in and beyond your work? If applicable explain how it has had an effect beyond your own institution. How has your provider made a significant and distinctive contribution to your local economy and wider community? This award seeks to reward the adult community learning providers whose imagination and passion have led to responsive provision. We are looking for evidence of excellence in providing a high-quality curriculum with excellent student outcomes, reflected in strong recruitment and success rates. It is open to all ACL providers, including institutes for learning (specialist designated institutions) and adult educational charities. How do you evaluate and develop your institution’s professional progress with regard to teaching, learning and assessment. How has your provider made a significant and distinctive contribution to your local community? This will be awarded to the provider that has demonstrated exceptional performance in the past academic year.  It covers the year 2017-18 and will be chosen from the winners of the FE college, Training provider, Sixth-form college, Adult and community learning provider and Specialist provider of the year categories. Although teaching, student achievement and business performance will be taken into account, the main criterion will be evidence of particular bold, imaginative and innovative initiatives that have advanced your reputation over the last year. This award supported by the British Council recognises, celebrates and promotes excellence in international collaboration. International work comes in many forms, and international experiences are a key mechanism in staff and organisational development and ultimately in improving outcomes for learners. Entries are invited from colleges that have improved organisational or staff capacity and/or learner outcomes through international projects. We are particularly interested in those projects which have contributed to quality improvements at an organisational, staff or learner level and those that offered an international experience to learners, either through mobility or collaborative work in the UK, who may not otherwise have had one. This award supported by The Careers and Enterprise Company seeks to celebrate an outstanding example of ‘Careers Education and Guidance’. In a world where enterprise, education and work opportunities are constantly changing, students need easy access to high quality support and information. Learning how to make informed decisions is increasingly critical to a successful life. The award is not explicitly targeted at any single group but is likely to celebrate highly effective engagement with schools, employers and other agencies, to provide learners with excellent impartial careers education, advice and guidance. Assessors will be particularly interested to see applications where colleges have supported learners of any age, to research, develop and establish their own enterprises. Edge wants to recognise, celebrate and promote examples of excellent practical teaching and learning. We believe that practical technical and professional learning is vital to young people and to the UK as part of a 21st century global economy. Life-changing: the college can demonstrate that new opportunities are now open to students and how their experience at college has made a substantive difference to their future life chances. This award is focused on curriculum development, perhaps innovative practice that might be new to the college or to the sector. It could involve new kinds of opportunities and courses, or new ways of learning. Applications which show how colleges can successfully reach new learners in the workplace, through distance or open learning, or in partnership with schools, universities or employers, are welcome. Of importance will be the sustainability of such innovation, and recognition by peers in the sector that this way of developing the curriculum is new, dynamic and effective. This award supported by the Skills and Education group seeks to celebrate an outstanding example of a college’s ability to reach out and widen participation. The winner will have well established and exceptional strategies to target underrepresented groups and/or provide transformational educational opportunities targeted at ‘non-traditional’ FE college students. Assessors will look for effective and imaginative approaches undertaken to attract and motivate learners. Outcomes will be measured in the successful acquisition of skills, knowledge or qualifications and clear progression routes to further learning or employment. It is likely that the target group will be adults and local, but they could also be located regionally or nationally. This award is supported by AoC and will celebrate the important work colleges are doing to support the mental health and wellbeing of their learners and staff. The rise in ill health amongst learners and the greater public is of great concern and is attracting heightened attention nationally. Project proposals might include innovative ways of supporting learners at risk of leaving courses; effective and comprehensive staff wellbeing programmes; dynamic approaches to the education of staff and learners about mental health and wellbeing. Applications will be welcome from colleges which show how they have successfully supported people in their local communities, existing learners or teaching and support staff will be welcome. Of importance will be the sustainability of such innovation, and some recognition by those outside the college that this work has longer term benefit and is sustained over time. This award supported by Jisc seeks to celebrate an outstanding example of the ‘Use of Technology’ carefully designed to improve the student experience - in a digital age. Underpinning the project is likely to be enhancements to teaching, learning and assessment and/or the creation of business efficiencies. In every case, changes made will be valued by learners and easily evidenced. The innovative use of technology might be applied across specific provision or support a college wide approach. The project will be above and beyond what is the ‘norm’ and applications are not restricted to a specific type of courses, for example ‘Information Technology’. Outstanding use of technology might be targeted at specific age groups or more generally those who study for all their time at a main campus or remotely. This award supported by City and Guilds seeks to recognise exemplary practice in the delivery of provision: responsive to the needs of employers. The winner will need to demonstrate an outstanding ability to work with and provide a direct service to employers. In particular, the winning college will be highly effective in meeting employers’ skills needs and/or apprenticeship requirements. In addition, it is likely that there will be excellent examples of the College engaging with employers - to support the development of employability skills within the curriculum. The award is not targeted at a specific group, but applications should demonstrate a clear, long-term vision of partnership and working with employers. The provision offered should enable the development of a skilled workforce and contribute to local and regional economic development. The successful project is also likely to be very responsive to identified skills priorities and levels of unemployment. This award is supported by RCU and AoC seeks to celebrate outstanding examples of learner support provided by a College for a significant group of learners, across a whole provision or college wide approach. This award might cover both learner and learning support. The provision will be above and beyond what is the ‘norm’ and applications are not restricted to a specific type of course or programme. For example, applications would be welcome from colleges describing their bespoke provision for learners with autistic spectrum disorders, or an outstanding example of information, advice and guidance, or excellent learner or learning support for adults returning to learn.